This article is part of the cover story for the August 2018 issue. Find more from the story here. Click here to subscribe. With water all around Seattle, there are plenty of places to put in a kayak for a day on the water. But not all bodies of water are alike. We tapped Amanda Lee of Alki Kayak Tours for some recommendations on where to go, depending on what you want your experience to be. 1. Elliott Bay. You will have to mind the boat traffic—which can be significant and include large ships and ferries—but Elliott Bay offers some of the best views of downtown Seattle from the water. Access points dot the Seattle waterfront, such as Elliott Bay Marina, the boat ramp at Don Armeni Park in North Admiral and the Washington Street Public Boat Landing downtown. Note that paddlers must always yield to shipping and ferry traffic, and know boating rules and regulations. 2. Southworth. Take the ferry from Fauntleroy in West Seattle to Southworth on the Kitsap Peninsula and experience some great open-water paddling near this small community. If you’re up for it, cross Puget Sound to Blake Island for further exploration. 3. Owen Beach. 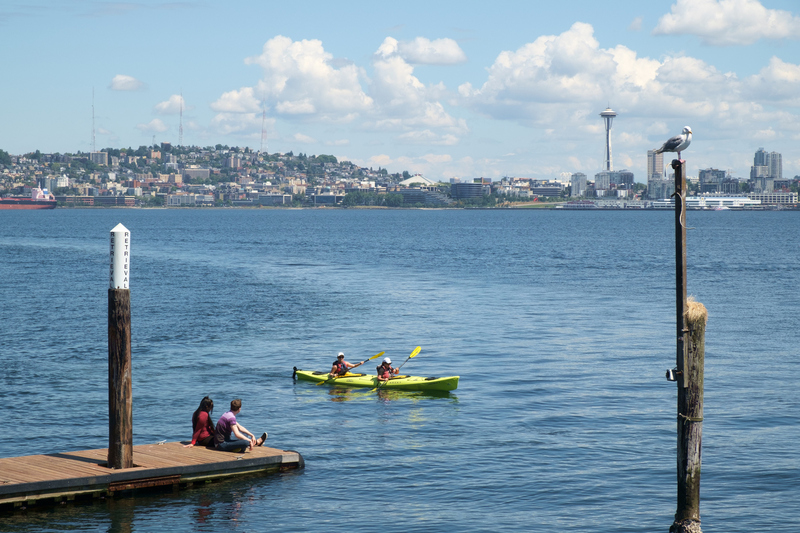 Launch your kayak from the beach, part of Point Defiance Park in Tacoma, and then head south, following along the waterfront promenade for a scenic paddle; keep going to see the best of Old Town and Ruston Way. 4. Titlow Beach. Just south of the Tacoma Narrows Bridge, the waters off Titlow Beach offer great views of the bridge and Gig Harbor to the north. Or, paddle south to catch a glimpse of Chambers Bay Golf Course, where the 2015 U.S. Open took place. Westlake, 2100 Westlake Ave.; 206.281.9694. West Seattle, 1660 Harbor Ave. SW; 206.953.0237. Eastlake, 1001 Fairview Ave. N; 206.682.2031. Ballard, 7901 Seaview Ave. NW; 206.494.3353. Gig Harbor, 3419 Harborview Drive; 253.358.3491. Tacoma, 5912 N. Waterfront Drive; 253.404.3960.